Left: Ichiro Takeuchi. Right: Ray Phaneuf. 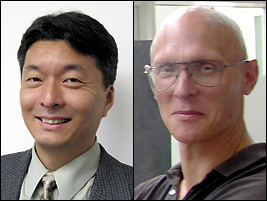 The Department of Materials Science and Engineering (MSE) extends its congratulations to associate professors Ray Phaneuf and Ichiro Takeuchi, who have been promoted to the rank of full professor effective July 1, 2009. Phaneuf's interests include nanotechnology, surface physics, low electron microscopy, photoemission electron microscopy, scanned probe microscopy, and templating for directed self-assembly. Takeuchi works with combinatorial synthesis and characterization of novel electronic and smart materials, fabrication and characterization of novel thin-film multilayer devices, and microscopy. Within the past year, both professors' research has attracted the attention of both the academic community and the media. A story about Phaneuf's work on templating for directed, atomic-level self-assembly—which could be used to "grow" new kinds of computers and sensors—was picked up by online and print news outlets around the world. The research was presented at the Nanosteps workshop in France and selected for the Virtual Journal, published online weekly by the American Institute of Physics and the American Physical Society. Virtual Journal editors hand-select recently-published papers they feel researchers should be familiar in order to keep up with developments in the field. Takeuchi was recognized for his group's recent discovery of a new, lead-free piezoelectric material that could replace PZT, a lead-based compound widely used in electronics. After the research was published in Applied Physics Letters, a corresponding press release received wide distribution. Takeuchi was also selected as one the nation's 100 most outstanding young engineers invited to attend the National Academy of Engineering's 2008 U.S. Frontiers of Engineering Symposium, a special forum for young engineers (aged 30-45) from industry, academia, and government to discuss their pioneering research. Both professors were also recognized by the Clark School as "Research Leaders" for their efforts in bringing sponsored research dollars to campus.